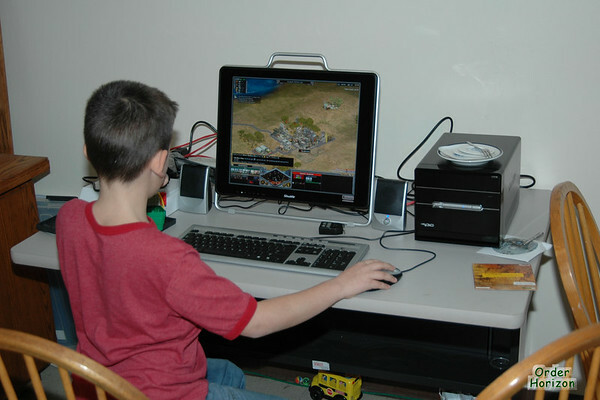 Corwin has been playing Rise of Nations quite a lot since the new boyen computers arrived. This is is a “real time strategy” game, where you build a civilization and then conquer the world. The games play continuously, there are no turns. The game pieces are very detailed — for instance, when an artillery piece fires, you can see the crew setting up the gun and reloading it. Charles also spends time watching Corwin play, in case Corwin gets to a stage in the game where carriers can be built. Corwin even lets me play with him now and then, the two of us versus a set of computer players (Corwin refuses to play directly against me). I think the boyen may be playing a bit too much, though. Not only does Charles get worked up about unit building strategies, but last night at dinner Charles started humming the main musical theme from the game. He did it well enough that I recognized it (although poor technologically impaired Mom didn’t). I started humming it with him and then Alice joined in, at which point Mom declared “No more singing at the dinner table!”. Here you can see Corwin gaming away on the new computers (isn’t that just the cutest little thing? — the computer, I mean).